This simple question is the basis for calculating a Net Promoter Score (NPS) and has been used by businesses of all sizes. Its purpose is to help companies measure customer loyalty. The creators of NPS state that this metric is directly related to revenue growth. Considering that keeping existing customers is 25 times cheaper than getting new ones, it’s worth learning about. Hundreds of fortune 500 companies have used NPS, including Microsoft, General Electric, and American Express. But is it the best metric for customer loyalty? Is it right for your business? How do you even use NPS? Why do some researchers throw cold water on the claims of NPS? Those are some of the questions I’d like to answer for you in this post. I’ve dug into research and case studies and condensed them down to a few key findings you should know. How Do Businesses Actually Use NPS? Does Research Support the Use of NPS? 6. Do the Categories Make Sense? What Are the Alternatives to NPS for Customer Loyalty? Can You Use NPS Effectively to Drive Business Growth? Is NPS Right For Your Small Business or Startup? It’s a term I heard several times before I thought about what “Net Promoter Score” actually meant. “Net” – The difference between some positive and negative values. “Promoter” – Someone who talks about your business to others (positively or negatively). “Score” – A single number that gives you an idea of your success. Putting that all together, and NPS is a score that tells you how likely your customers are to promote you to others, and hopefully result in new customer referrals. Fifteen years ago NPS was created by Frederick Reichheld and a team from Bain & Company. It was popularized via a Harvard Business Review article called “The One Number You Need to Grow”. In his paper, Reichheld claimed that NPS is ‘the best predictor of growth’ for a business. Obviously, a lot of businesses agree with this claim, since they use it heavily. We’ll look at some conflicting research shortly. Calculating the actual NPS is simple once you have the data. A simple example is the easiest way to learn how it works. First, you ask customers to rate “how likely it is that they would recommend your company to family or friends” on a scale from 0 to 10 (11 points for them to choose from). Many companies, like PetSmart, deploy website pop-ups to ask the NPS question. There are plenty of third-party vendors, like Medallia and Qualaroo, that offer NPS-based pop-ups. Detractors (score of 0 to 6) – These customers are unlikely to recommend you to others, and might actually speak negatively of your business to others. Passives (score of 7 or 8) – These customers like your company, but aren’t likely to enthusiastically refer new customers. Promoters (score of 9 or 10) – These customers love your business and are most likely to promote it to others, as well as be recurring customers. As the names suggest, detractors are bad, passives are essentially neutral, and promoters are great to have. Your NPS score is calculated by subtracting the percentage of detractors from the percentage of promoters. Passives are ignored for the calculation. To calculate your NPS, you simply subtract 20% from 50% and drop the percent to end up with an integer. Here, that results in an NPS of 30. What’s a good score? An excellent score is considered to be 50 or higher. The maximum score is 100 if every single customer is a promoter. Note that NPS can actually be negative if you have more detractors than promoters, which happens fairly often for large businesses. In this 2015 video, Rob Markey, a Partner in Bain & Company’s New York office, describes the Net Promoter Score and the Net Promoter System. What is so special about this single number? It gives you a metric to try and improve on. Any business can use it. To use it, companies measure NPS on an on-going basis and try to improve their customer delight. Using NPS scores over time, they can figure out if their changes to processes are actually effective at improving customer loyalty or not. Sometimes, businesses will also add an open-ended question after the standard NPS question. They will ask customers to provide a reason for their score, which can result in specific issues to work on. It’s important to realize that many businesses do not use NPS in isolation but as part of an overall “VoC” strategy. VoC stands for “Voice of Customer” and refers to research that a company engages in to determine how a brand, or its individual products and transactions, are perceived. VoC is about getting feedback directly from customers in order to improve customer experience. A lot of research has been done on NPS. Some support the use of it, while others argue that it’s not the best way to measure customer loyalty and predict business growth. To save you the trouble of reading all these papers, I’ll sum up below the research claims against NPS. After collecting all your data, you’re left with a number. Critics say that leaves you guessing what the actual cause of that root number is. Was your customer service lacking? Was your product not good enough? Was your shipping too slow? NPS does promote asking an open-ended question that follows the request for customer feedback. After a customer gives you a score, they’re invited to provide the reason for the score. Still, some claim that NPS itself doesn’t produce actionable feedback. It’s simply a result of your business operations as a whole. 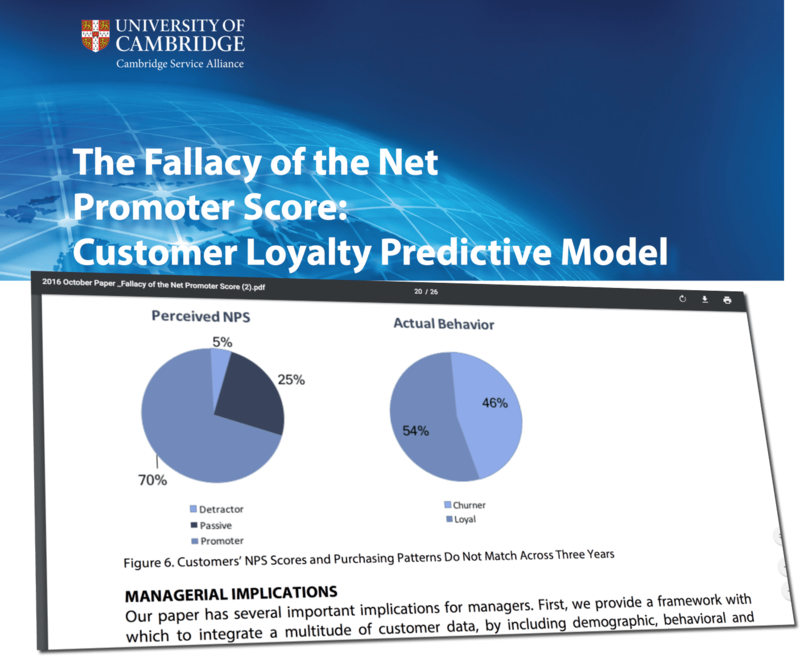 A fairly recent paper from the Cambridge Service Alliance found that many customers are misclassified based on NPS when looking at their actual spending behavior in the future. The researchers built a model based on several points of data that represented customer activity (purchases, purchase size, feedback, etc.). This allowed them to compare NPS with customers’ future purchases. What they found was that many promoters were not promoters (in terms of being the most loyal and best customers), and many detractors were not detractors. With their model, they eliminated the need for the passives category and split customers into either detractors or passives based on their behavior. The University of Cambridge research paper contends that “NPS measurement does not necessarily correspond to actual behavior.” The researchers advocate for a multi-dimensional model, rooted in big data, that taps behavioral and attitudinal data. The problem is obvious: If NPS isn’t accurate enough, you’re measuring your results with bad data. It’s a big difference, but clearly, NPS got a decent chunk right. So this doesn’t completely invalidate the effectiveness of NPS but does call it into question. Another set of researchers, led by Timothy L. Keiningham in 2007, published a paper that argued other metrics were better measures of customer loyalty than NPS. In their research, they found that NPS was no better than ACSI. Other research out of Stanford University also found that other indicators are equal or better measures of customer loyalty and referrals than NPS. The most effective indicator their research found was how much a customer “liked” a company. Again, NPS isn’t necessarily bad, but it may not be the “best,” despite being so widely used. Both Keiningham and other researchers like Morgan and Rego have attempted to replicate the initial claims that NPS outperforms other metrics for customer loyalty. They were unable to do so. All the other research that I summarized above that stated that they couldn’t prove that NPS was the best essentially found the same conclusion. Some researchers like D.B. Grisaffe question whether the labels of detractor, passive, and promoter fully make sense. Think of it this way: Is a detractor who answered a score of 0 the same as a detractor who answered a score of 6? Common sense tells you no. Perhaps NPS has oversimplified things. Someone who gives a score of 4-6 might just not feel strongly either way. They probably won’t say bad things about your business to others. Grisaffe and others, point out that these category cutoffs are more or less arbitrary. Reichheld never gave any concrete justification for them. The research shows that NPS is likely a decent way to measure customer loyalty, but it may not be the best. The ideal alternative, presented in the Cambridge Service Alliance paper is a big data model. The idea behind it is to train a model based on several points of demographic, behavioral, and attitudinal data that you collect from past customers. By doing this, you get a much more accurate classification of customers (allegedly ~96% accurate, compared to 15-28% for NPS), which helps you truly know if your work is having an effect or not. This table, from the Cambridge report, includes accuracy data. It can also be used to predict future results. This approach has been supported by other researchers like Lerzan Aksoy. That sounds kind of complicated, doesn’t it? If you have no background in machine learning, this big data approach probably sounds like nonsense, or impossible to use. And you’re right. There’s no easy way for a small business to do this. It’s primarily an approach that is reserved for larger companies for the time being, unless you can afford to hire a software engineer to do it for you. For most businesses, NPS still has productive applications especially when it comes to measuring customer delight. Be aware of its limits, however, and avoid viewing it as a sole predictor of business growth. The most common sense approach is to use a survey approach in combination with NPS. 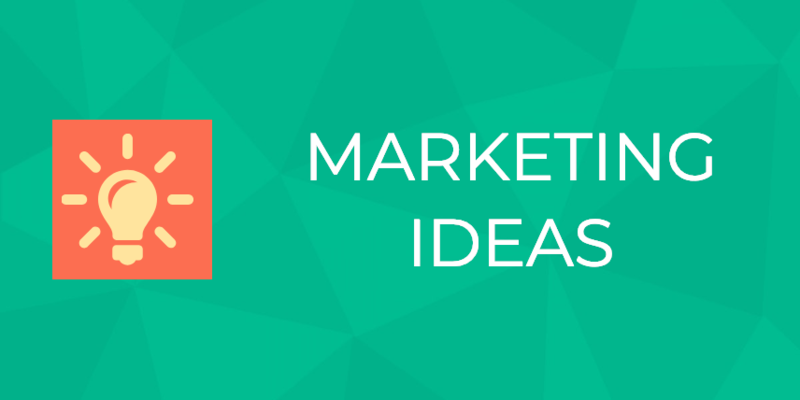 Instead of just asking how likely someone is to recommend your business, or how much they like your company, get specific, open-ended feedback at any touchpoint you can. This includes points before and after purchasing. You want to connect NPS to specific buying behavior, and also use the feedback to get actionable things to work on. Once again, the Cambridge Service Alliance study also did this. They collected as much written feedback from customers as possible, then used text mining to identify patterns. You can collect feedback without fancy text mining programs of course. And third-party software providers who have NPS baked into website pop-ups — such as Delighted and Qualaroo — also have “customer success managers” and online knowledgebases that can provide valuable guidance to small businesses that want to deploy NPS and customer feedback tools effectively. In summary, NPS isn’t the holy grail of customer loyalty metrics that some might have you believe. But, it definitely has some beneficial uses, especially for small businesses. Try to rely not only on NPS but collect additional data about customer behaviors and try to correlate feedback to actual buying behavior and referrals.